Naya’s original artwork was inspired by Banksy, an anonymous England-based street artist who creates graffiti-like images. His works of political and social commentary have been featured on streets, walls, and bridges of cities throughout the world. Naya’s work depicts two people leaning in for a kiss. Their heads are presented as flashing green lights, symbolizing consent. 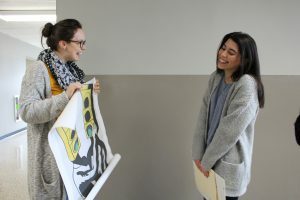 “I wanted to create something that was simplistic, but held greater meaning, like most of (Bansky’s) pieces,” said Naya, who graduated early this past January and plans to use the gap time until college to travel, study art history and grow her portfolio of work. Naya said the win makes her feel accomplished and appreciated. “I often have a lot of doubt about pursing art, but it is small victories like these that give me the confidence to keep pushing forward,” she added. Her artwork just completed being on display in the 2 Alices Coffee Lounge in Newburgh. 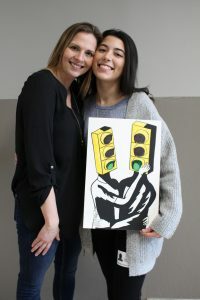 Her award included being presented with a check, a certificate, her original artwork and an enlarged version of her artwork as a “thank you” from Safe Homes on March 22. Currently, Naya is working on a mural and exploring different art techniques such as acrylics, oils, air brushing and digital drawing. And, she reinforced the importance of her Warwick education.